There is a small kingdom called Mergosono. Although Mergosono is small, it is famous because the king is a very good and wise man. One day, the gods hear about the king’s goodness and wisdom. So, they decide to test him. The king of the gods sends four of his gods to Mergosono to test the king. At that time, the king’s son, Pangeran Sembara was studying abroad. So one of the gods disguise as Pangeran Sembara. Two other as villagers while one disguise as a villager who is killed by Pangeran Sembara. 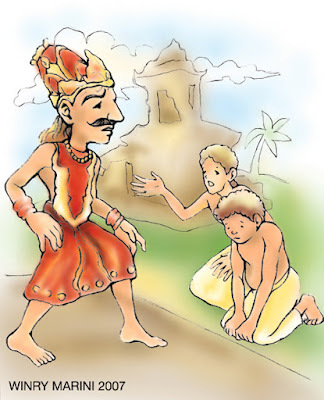 The two villagers then go to see the king to tell him about the death of their friend. They say that they saw the prince killed their friend. "I accept your report. But my son hasn’t returned from his study. I will hold my judgement until his return. If my son indeed killed your friend then I will give him the punishment he deserves. But if you lie then I will punish you for ruining my family’s good name,” says the king. When the two villagers leave, the king calls his trusted advisors. He asks for their opinion about this matter. They all agree that if the report is true then the prince should be punished. The king is sad to hear that but he knows he must uphold the law. The next morning the false prince comes to see his father. He admits killing the villagers. So the king decides to execute the prince for his wrong doing. The next day the prince is going to be hung as his punishment. When the executioner hangs the prince, suddenly his body disappears and a voice is heard across the field.